How to export a certificate from a certificate store using "certmgr.msc"? I want to keep it in a certificate file. You can export a certificate from a certificate store to a certificate file using the "certmgr.msc" tool as shown in this tutorial. 1. Start "certmgr.msc" Management Console on your Windows 7 system. You see list of certificate stores showing up. 2. Click to open "Trusted Root Certificate Authorities" certificate store and click on "Certificates". 3. Locate and double-click on "NO LIABILITY ACCEPTED, (c)97 VeriSign, Inc.". You see certificate viewer showing up with "General" tab open. 4. Click "Details" and click "Copy to File..." button. 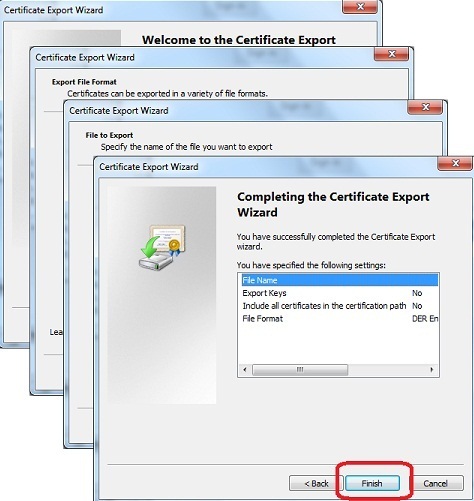 You see Certificate Export Wizard showing up. 5. Click "Next" button. You see "Export File Format" screen showing up. 6. Keep the default format "DER encoded X.509 (.CER)" and click "Next" button. You see "File to Export" screen showing up. 7. Find the folder where you want to save the file, enter a file name like "VeriSign_Expired.cer" and click "Next" button. You see confirmation screen showing up. 8. Click "Finish" button to save the CA certificate to specified file.